Let me just start off by saying - I overcooked it. In my overzealous attempt to grill away the "nasty" I ended up with more grey than pink peeking out of the center of my painstakingly sliced heart. It was still quite tasty with none of the weird flavor the butchers had warned of, but I've adjusted the cooking times to save you from making the same mistake. 1. Make Heart Marinade: Crush 3 garlic cloves (skin on) and thyme with a mortar and pestle. Mix with wine, lemon and orange juice, and a splash of olive oil. Let sit at room temperature for 1 hour. 2. Prepare your Artichokes: Rub the cut sides and bottoms of the artichokes with the lemon wedges and place in a large pot of boiling water. Weight them down with a heavy dish or bowl if they're floating, and simmer, partially covered, for about 15 minutes. You'll know they're ready when an outer leaf pulls off easily. Drain upside down. 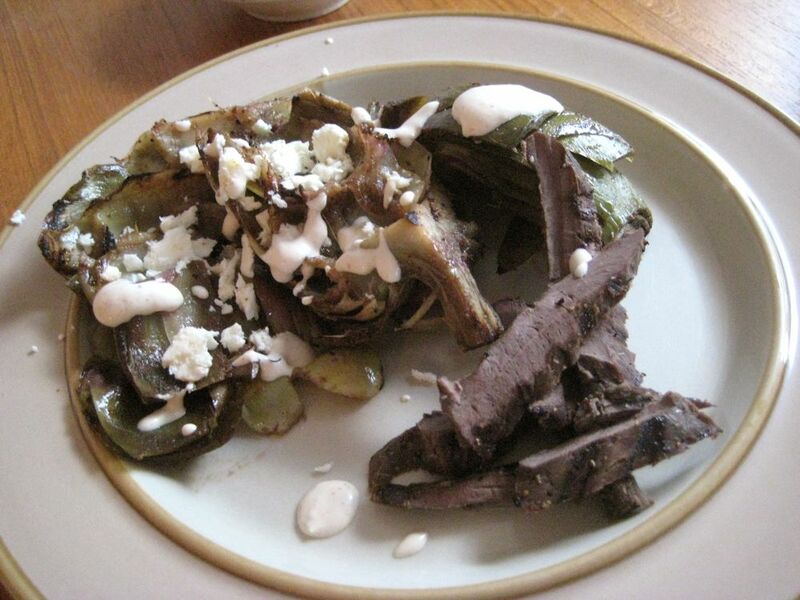 When cool, cut the artichokes into quarters and discard the spiny purple leaves and hairy choke. Once your heart is in clean pieces (I had 3 pieces) add to the heart marinade and let them soak up the flavors for at least 2 hours in the refrigerator. 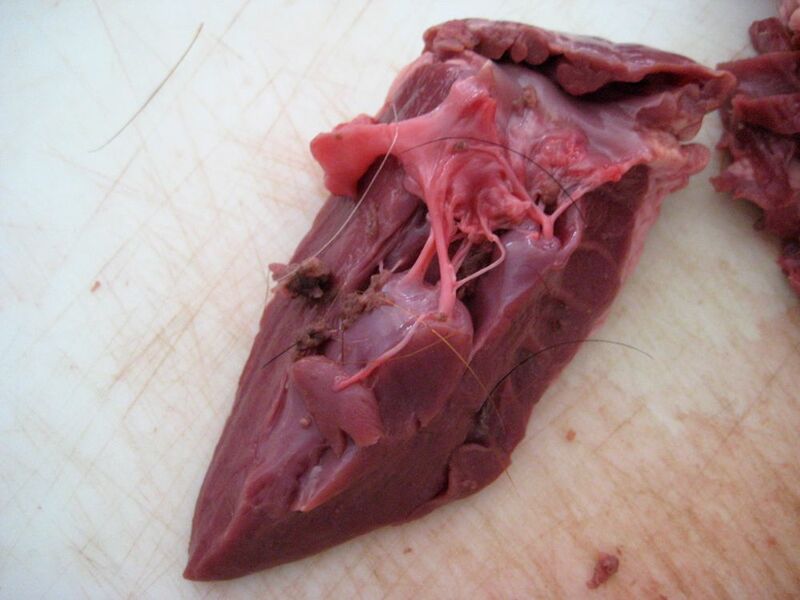 As you can see, I got a nice surprise when I cut into the heart to clean it - it was hairy! I sent an email to Chris Cosentino's website asking about it, but haven't heard anything back yet. I'm guessing that the hair just gets washed in there when the animal is processed. Cleaning it out was no big deal, but the hairs were really lodged in there and I wasn't able to salvage the scraps to make stock with. Bummer. 4. Make the artichoke marinade: In a ziploc bag, combine the olive oil, vinegar, garlic, salt, and pepper. Add the artichoke quarters and toss to coat. Let marinate, refrigerated, for 2 to 4 hours, jiggling the bag around every half hour to redistribute the mixture. 5. Grill it up! It was raining the day we tried this one out, so we used our cast iron grill pan and I pressed the meat using a few pans and bowls. Cook on medium high until medium rare - for 30 seconds to 1min on each side. 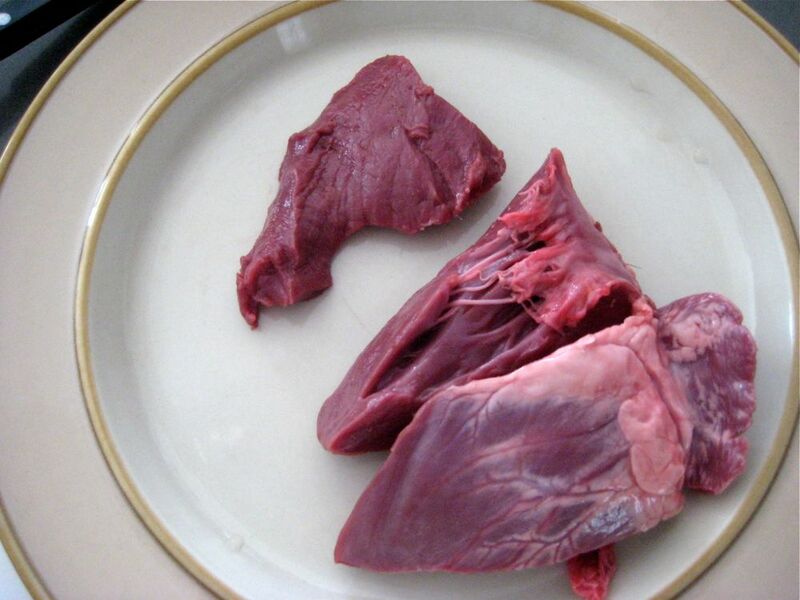 Remove the heart pieces from the grill and set aside to rest for a good 5 minutes. Grill the artichokes until each side is crispy. 6. Thinly slice the heart against the grain and plate with grilled artichoke quarters (we eat a lot of veg, so we went with one artichoke per person). Crumble feta over the entire plate and drizzle some of the rémoulade over the 'chokes. Serve with the rest of the rémoulade on the side for dipping. 1. Add all ingredients except for the lemon juice to the mayo. Stir gently with a spoon. 2. Slowly whisk in lemon juice 1 tbs at a time until the sauce is to your liking. I prefer mine I little stiffer so I only add 2 tbs.